This book is a mixed bag which is not surprising considering there are 100 artists featured. 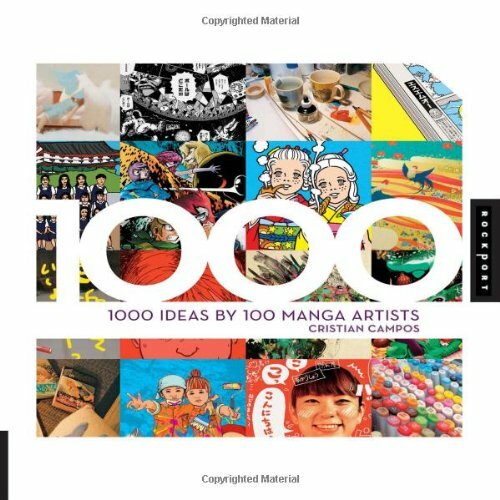 The thing about the 1000 Ideas series from Rockport Publishers is that it's not easy to get just top notch artists included. About half the artists are Japanese. Other half are from America, German, UK, etc. Some are professional, some not. A diverse range of work is featured, but there's disparity in the quality of work too. All the artists are new to me and I've not seen any of their work before. There's no big name manga artists. Each artist is given 20 questions of which they choose and answer 10. They are actually interview questions about their inspiration, tools they use, their style, views on manga, etc. There's not a lot on techniques. There's plenty of imagery of illustrations and doodles of all sorts. Again, some are inspiring and many not. Reading this book is like visiting random art blogs. You'll never know what you'll find.